As the Spring semester gets under full steam, I thought I would take a few minutes to discuss how I'm presenting lectures in my on-campus classroom these days. 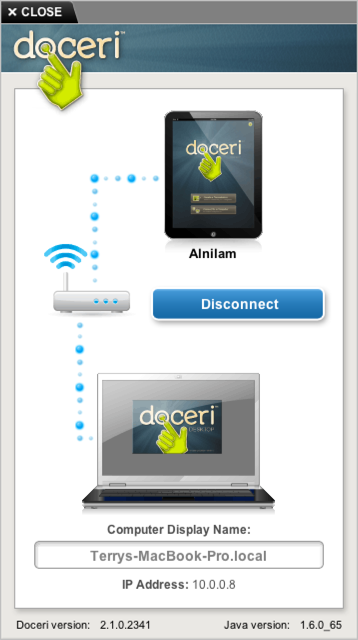 Once connection has been established, you are now seeing/controlling the computer's desktop entirely through the iPad. You can touch anywhere on screen to 'deliver a mouse click'. Usually at this point, on the iPad, I tap CLOSE to hide the connection window on my computer. The iPad is now in control of the situation and from this point forward I'm running my classroom presentation from anywhere I care to walk in the room using my iPad. Welcome to my lecture! I launch Keynote and the day's presentation comes onscreen for the students. I tap the right side of my screen to move to the next slide in the presentation. I can type the left side to return to a previous slide. I can almost hear you yawn at this stage, so let's liven it up a little bit. On my screen (unseen by the students) I have lots more controls. Let's have a quick look at annotation... Yup, I can now, easily, accurately annotate my slides in real time. Using annotation panel (top center) I have added red marker, green highlighter and red arrow. Each item in the annotation panel is customizable. You can alter pen type, thickness, color, opacity, or configure special shapes like arrows, rectangles, ovals. I highly recommend each user create their own custom panel of most favored annotations so you can easily select your favorite on the fly.